Today's guest post comes from another Mama and blogger, Andrea Genevieve Michnik. Today, Andrea will be sharing how to make your own props for those fun holiday photo shoots that many of us are all scurrying to get done this time of year. Take it away Andrea! Family holiday photo shoots can be challenging, especially with a toddler in tow. Last year for my own family’s holiday photo, we only had two different props, and my 1-year-old son lost interest in about 10 minutes. I learned my lesson. This year I’m pulling together a basket with plenty of handmade options for us to pose with, depending on how we feel during the moment. The end result may be silly, romantic, cozy, or cute. No matter how it turns out, I’m certain it will be an honest and heartfelt depiction of my family at this point in our lives, and I can’t wait to share it with our loved ones through our holiday cards. 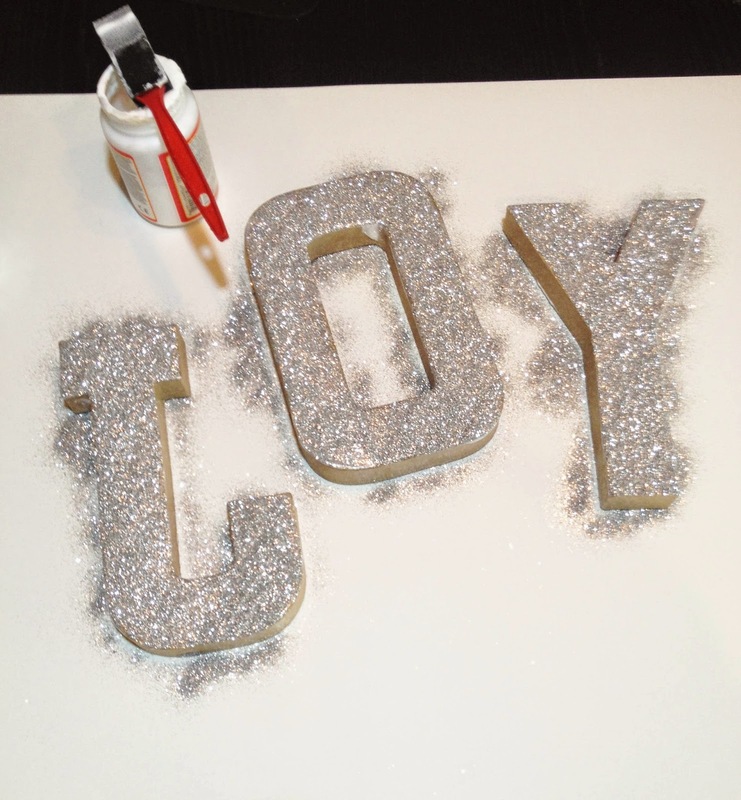 First, I’d like to offer step-by-step instructions for creating a craft I’m extra excited about: DIY glitter letters. After that, I’ll share a few of my other favorite DIY prop ideas, from oversized ornaments to a modern Christmas tree made from cardboard. This project is a fun way to create a card that really says something — literally! You can spell out festive words like “Joy,” “Peace,” or “Merry,” or choose to go for a custom twist and create your family’s last name. 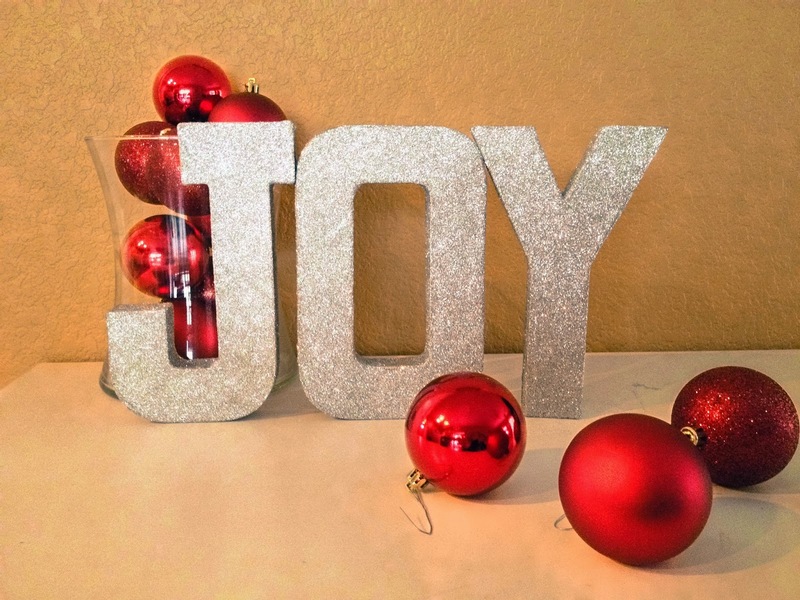 Best of all, the letters can work as holiday décor in your home for years to come. 1. First, pick out what you want your letters to spell. For this tutorial I went with “Joy” because I’m going to use them through the winter as a table centerpiece. 2. Lay the letters down on your newspaper or scrap paper. 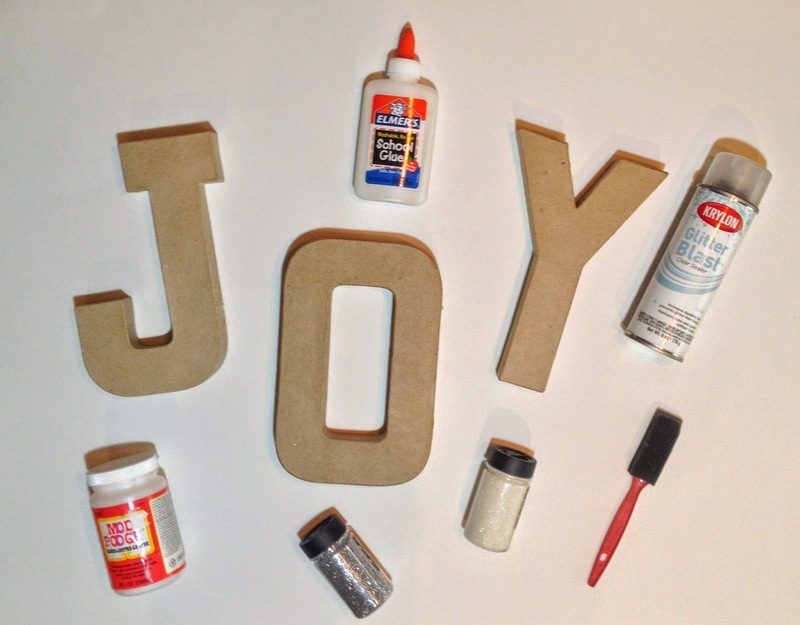 Using the paintbrush, apply glue to one side of one letter. Make sure that every inch is covered. A thick layer of glue works best, but watch out for drips. 3. Apply the glitter generously. You shouldn’t see any of the letter or glue peeking through. If using Modge Podge, stick to one letter at a time, since it dries pretty quickly. 4. Once you've glittered one side, let the letter dry for about an hour and then flip it over to do the same to the backside. 5. 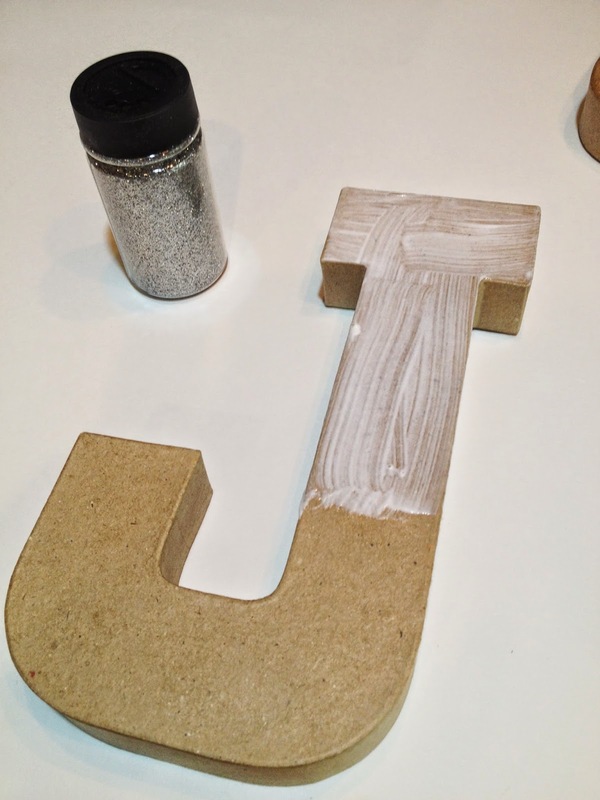 When both sides dry, finish with glue and glitter on the edges of all letters. You could always do the edges in a different colored glitter. 6. 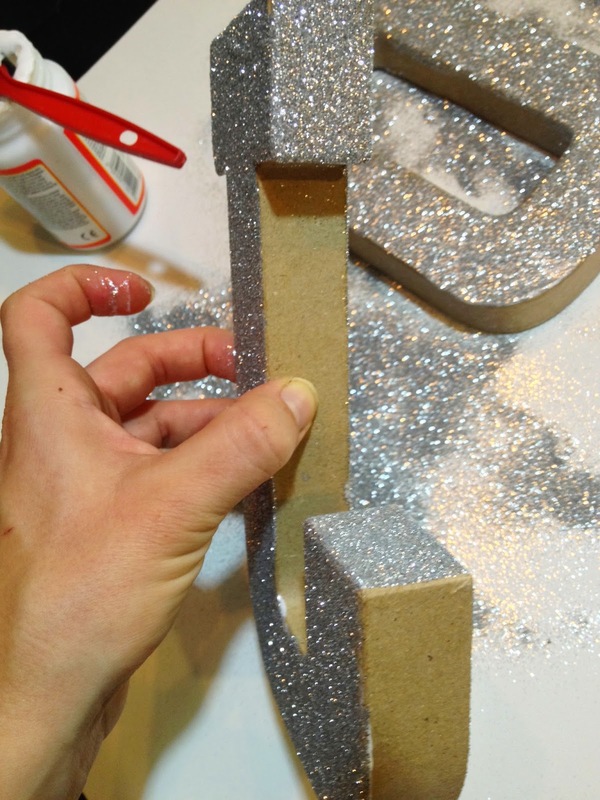 The final step is crucial and this is to seal the glitter with a clear finishing spray. Glitter is fabulous — don’t get me wrong — but no mom wants to spend their holidays cleaning up glitter trails around the house! For a totally different look, try covering the letters in holiday wrapping paper, metallic spray paint, or use rustic jute twine wrapped around each letter. Take a plain wooden trimmed chalkboard and paint the edges red, green, silver, white, or gold to match your setting. Scribble out a cute phrase or the year. Use a variety of seasonal 12” X12” scrapbook paper and fold into stars using this guide. Make a huge pile for you and your family to hold or toss in the air. These huge ornaments made from gigantic colored balloons look so awesome! Any prop that is larger than life will be tons of fun for both kids and adults. Attach a string to each balloon and use cardboard with wire to recreate the ornaments’ cuffed top. If you’re going for a more modern look or don’t want to have a living tree in your home, this cardboard version can be assembled to any size and painted to accentuate your home design. Andrea Genevieve Michnik is a mompreneur, serial crafter and blogger living in Austin, Texas. When Andrea isn’t knitting for her shop or exploring the outdoors with her adorable toddler, she is helping other local female entrepreneurs to empower themselves professionally. Andrea shares her maker insights and other Christmas card crafts on the TinyPrints blog , and you can find out what she’s up to on her Twitter and personal blog. I loved making these letters and they look great sitting on our kitchen island. Hopefully you get a chance to make some too, they are super easy and look fantastic when finished. Cheers! Good evening, ladies! I am totally a DIY homemaker/teacher on the run! And I think this year for photo shoot purposes, I will literally have to have props to move about the house and change around. OH THE FUN!!!! And so simple to make. Thanks so much for sharing, Stacey and Andrea. xo. I've never used props unless you count Mall Santa to be one! LOL! Love the giant ornament idea the most! Oh, how festive and fabulous!!! Imagine all the fun words we can make :) Thanks for sharing. Love this guest post. What a fun and festive look. I really need to step up our holiday decor!